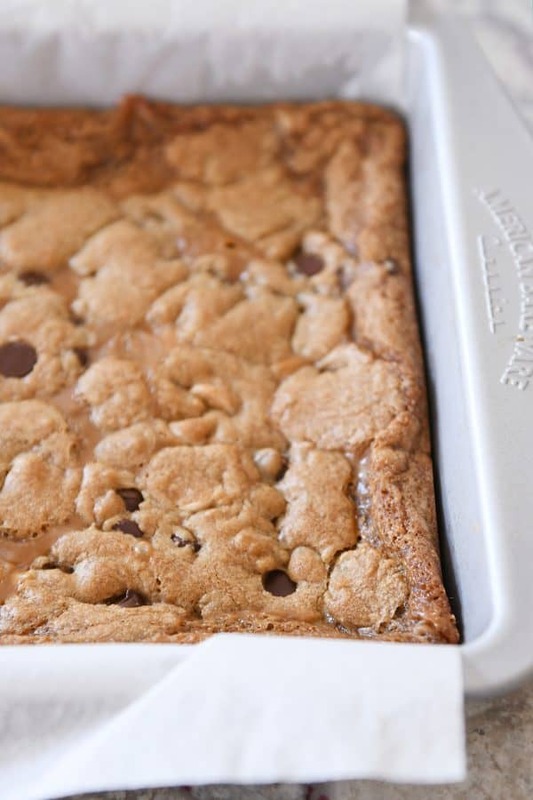 Preheat the oven to 350 degrees F. Line a 9X13-inch pan (I use metal) with foil or parchment paper (to make cleanup easier with the caramel). Lightly grease the bottom and sides with nonstick cooking spray and set aside. Brown the butter by cutting the butter into tablespoon-size pieces and placing in a skillet (preferably not nonstick so you can see the changing color easily - quick tutorial here). Cook over medium-low heat until the butter melts, begins to sizzle, and the butter solids on the bottom begin to turn a toasty brown, 3-4 minutes. Watch closely; the exact time will vary. Remove from the heat and immediately pour into a medium bowl. Refrigerate the butter for 10 minutes or so (not too long or it will solidify) until no longer hot. Stir in the brown sugar, granulated sugar, baking soda and salt until evenly combined. Add the eggs and vanilla and mix until well combined. Stir in the flour and chocolate chips until no dry streaks remain. Take about 2/3 of the dough and dot in large pieces across the bottom of the prepared pan. Press into an even, thin layer.